Every evening our cabin steward put the program for the following day’s activity on our bed when he turned down the covers. From the first evening I had noticed an item, ‘register for Sabbath service in the library’. I had not expected Jewish passengers to be taken into consideration. I always enjoy meeting fellow Jews and feel an immediate kinship. There are of course exceptions. The first time I landed in Israel, I knew I was home. This strengthened my resolve to return and raise my family where we belong. This was an American ship registered in Nassau, Bahamas, with a Norwegian captain and multi-national crew. I didn’t know until sometime later, that the shipping company although Norwegian, is owned by the Ofer family of Israel. I don’t know if this was the reason for holding Sabbath services for the Jewish passengers. Friday, just before 6.00 pm I made my way, alone to the designated room, an annex of the main dining room, - Jill, not being eligible to count towards a minyan - did not think she was needed. At the door a pretty young lady, a member of the crew, dressed smartly in honor of Shabbat in a lovely red dress with a stole around her shoulders, greeted us. Her dress had a neckline that would have caused residents of Monsey and Boro Park, not to mention Mea Shearim, to flee or perhaps steal a quick look, albeit none of these orthodox Jews would be on a non-kosher cruise. I, obviously, did not have such inhibitions. Slowly we gathered, some fifteen members of the tribe, which included one Israeli, other than myself - a couple from Australia, fervent Zionists on their way home from a prolonged sojourn in Israel, and a majority of Americans, mostly women. We did not have a minyan in the orthodox tradition, but after some mingling and introductions, one of the American ladies ‘lit’ the Shabbat candles. As open flames, for obvious reasons, are not allowed on a ship, two miniature candle-like lights were clicked on. The gentleman from Melbourne said Kiddush and we all took part of some delicious Manischewitz wine and three halot, most of which went to waste. We lingered a bit longer and then as mealtime approached we sauntered casually towards the dining room. The following Friday night however word had reached the majority of the Jewish passengers. We had about forty people at the Friday night service. Once again our co-religionist from Australia did the honours and read the complete Erev Shabbat service. As an Israeli it was strange for me to hear him do it with Ashkenazi inflections, no longer used in Israel, except in the Ultra-Orthodox Ashkenazi communities. The one bottle of wine which the catering staff had provided was soon three and a glass for each participant was quickly made available. The halot were soon consumed, not wasted as they had been the week before. Among our members was a family, two women and a man, the younger woman’s husband, who we had noticed ate their own food from disposable tableware. We had been correct in assuming they were Jewish. 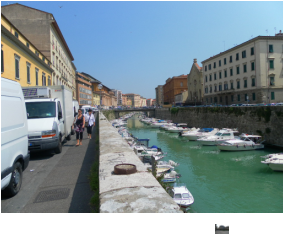 Saturday, 21st May we awoke and found ourselves already docked in Livorno. At no time during the voyage did we ever feel the engines start nor did we ever feel the ship ‘bump’ against the quayside, which I think is amazing for a ship weighing 90,000 tons, 293 meters long and 32 meters wide. To gain some perspective, 34 ships, all together weighing a total of 136,000 tons, were lost in the Atlantic in ‘Black May’ 1943, the worst month of the war. Until I researched our intended ports of call, I knew very little about Livorno, except that it is called Leghorn, in English, in honour of the Tuscan chicken and lies high up on the front of the Italian boot on the same curve as the French Riviera. A free bus was laid on by the Livorno municipality, which ferried us to a central location. Being Saturday, markets in both the street and designated buildings were in full swing. The entire Livornese population appeared to be shopping. Looking at the produce, I could see why. We, in Jerusalem have Mahane Yehuda, but it pales in comparison, in both quality and quantity. A large hall was full of permanent stalls, with cheeses, seafood, fish and meats, providing a colourful and appetizing display for potential purchasers. My innate Jewishness rejected automatically the forbidden foods, especially squid and those which look like harakim (insects). I was tempted to buy some Parmigiano-Reggiano, my favourite cheese, but I desisted when an image of the abundance of food provided on the ship flashed through my mind. 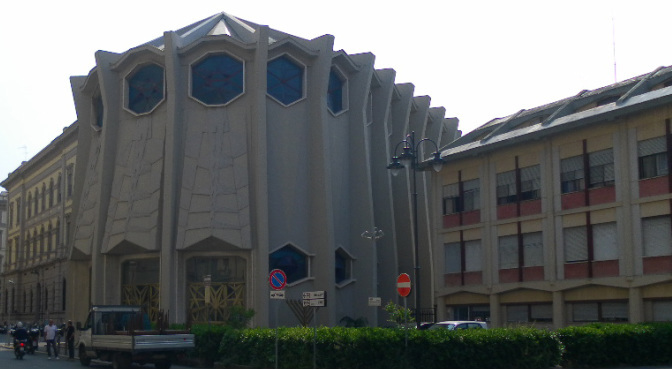 Livorno was one of the most welcoming of towns in Italy for Jews. I learned about Elijah Benamozegh,  a sage in the true sense of the word. He was not only versed in Torah, but in secular wisdom as well. If Judaism and Israel, in particular, had men like this today, we may be spared the politico-rabbis, who seem by comparison to be mere poseurs. Amedeo Modigliani, the modern painter, was also a Livornese-Israelite, and we sought out the house in which he had been born and in doing so toured the city. Passing the shul I hesitated before deciding that even though we carried our Israeli passports, it may cause a furore if, as strangers, we asked the guard posted at the door to let us in. I imagined a member of the congregation would be called out, causing consternation. I settled for a couple of photos of the exterior. The weather was warm. Jill and I were tired and needed to answer the call of nature. We made a pit stop at a little café, situated away from the tourist trap area of town. My Italian is of the same standard as my Spanish, but fortunately our English was understood well enough for us to ask for directions to the loo, and order a cup of tea for Jill and coffee for myself, along with a much needed snack. I could not figure out how to get water to flow from the tap to wash my hands, but later learned that one has to push the foot pedal, much like on a piano. There were two little tables with two chairs each, either side of the doorway. Sitting on the pavement, a prime location in most continental cities, I thought we would be taken for a ride and be charged over the odds. We were pleasantly surprised to pay only 5.5 Euros, about NIS 27. This was my first Italian coffee in about seven years, a real treat. Finding our way back to the Piazza Muncipale where the bus was waiting to return us to the ship was another adventure, during which we asked almost all the citizens of Livorno for directions. Saying “Piazza Muncipale” is enough to get the necessary help. Everyone was gracious even if they could not speak English and answer our query. We returned to the ‘Brilliance’ in good time for our ‘free’ lunch. One of our daily activities which we found greatly entertaining was the thrice daily trivia competitions, which were held at 11.00, 14.00 and 20.00. The day time quizzes were general knowledge and in the evening, music was the main theme, the quiz masters (mistresses?) being members of the entertainment staff, mainly youngsters from countries as diverse as Colombia, Portugal, UK or Brazil. The participants, for the daytime sessions, were few and mostly regulars, no more than ten or fifteen, often as little as six. Teams were a maximum of four, the number of prizes available for the winners, which included such must-have items as key chains, denim money pouches, hats and the biggest and best of all, a tote bag, all bearing the name “Royal Caribbean”, the company which owns the ship. The atmosphere was mostly jocular and competition fierce but friendly. Occassionally, according to staff, conflicts, especially between husband and wife, could arise. Our unpleasant episode involved a Jewish lady from New York, who asked if she and her husband could join Jill and me, to make up a foursome. How did we know she was Jewish, you ask? Upon introducing ourselves, the standard question of origin arose. She then told us that she had children in Israel. I take many things in life seriously, but I didn’t think trivia on a cruise was that meaningful. How wrong I was! I am aware that on occasion my voice is inclined to be raised, when I’m enjoying myself and relaxed. Perhaps I inadvertantly shared an answer with my companions too loudly, before we agreed and wrote the answer on the form provided. I received a very dirty look from the American lady, who admonished me in no uncertain terms not to talk too loudly. I think we won that competition, but our New York co-religionists made a point of avoiding us at all times, especially at trivia. The next day we met an American husband and wife, who said their daughter-in-law was Israeli, but they didn’t look Jewish! We didn’t ask questions. Sunday 22nd May our port of call was Rome. Jill was a little under the weather so we stayed on board. The evenings always had an abundance of entertaiment. All three lounges had live music catering to all tastes among the mostly mature cruisers. Beginning at about 5.00 pm until early morning, small bands and solo artists played jazz, popular music of the forties, fifties and sixties, Latin-American, and even classical music. The musical groups, unlike the theatre performers, appeared to be on board permanently and possibly lived in the crew’s quarters. Entertainment was promised and delivered for the entire twelve days, morning, noon and night. Boredom was not an option. The Pacifica Theatre seated 847 and every night a different show was put on twice to cater for early and late diners. An Abba tribute started the cruise and other shows included Broadway song and dance extravaganzas, Latin-American music and dancing, a Beatles ensemble, and an acrobat. I had to forego the comedienne, who got great reviews from Jill and all my table companions, because I wasn’t feeling well and needed an early night. Monday 23rd May found us in the port of Salerno, about 50 km from Naples, which may have been too crowded to take our mammoth vessel. The town is built alongside a mountain and suspended roads have been built in and out of the hillside. The port area is the usual mix of industry and small shops and cheap hotels. Some of the buildings in the area were once obviously desirable, but the years had taken their toll. The muncipality once again provided us with a free bus into town and Jill and I decided to see Salerno. Going to Naples and Pompei was not an option, the excursions being very expensive. Anyhow, if I want to see an old ruin, I only have to look in the mirror. The promenade along the waterfront stretches for many kilometres and rivals that of Tel Aviv. The main street were not very busy, but had a lively bustle. The shops were very attractive, with large windows and carefully arranged displays, both in the windows and in store. My daughter Alison, is interested in fashion, I was in Italy, admittedly not Milan, and the shop windows invited the fashion conscious. I took many photos to show Alison. The Italian women are very elegant, more so than the women of Barcelona, where we spent three days after the cruise. I have always imagined Italian women to resemble the fat mamas making pasta and toiling over a hot stove. That may be Hollywood’s take, but women, young and mature, chubby and thin, appeared fashionable and elegant. We strolled for some time around the town, venturing into some of the shops, comparing prices to Israel, where possible. Italy seemed less expensive. I passed one window and saw a ‘male’ display mannequin dressed in a very smart looking T-shirt and casual trousers. “I’m telling you those are pajamas.” Jill insisted. Being convinced Jill was wrong, although she rarely is, I went inside. A pretty young lady, very pregnant was alone serving several customers. The shop indeed appeared to sell underwear and pajamas, but I stuck to my guns. “Do you speak English?” I asked the young woman. I indicated to her that I wanted to ask about something in the window display and would she please come outside. “Si, pajama,” came the answer. I had learned the Italian word for pajamas. I thanked her very much in Italian, she returned to serve the ‘regular’ customers and we went on our way. I still think I should have bought those clothes. I would have looked as good as the clothes dummy, maybe even better. Italian ‘gelato’, ice cream is reputed to be the best in the world. Our final destination in Salerno was a ‘gelato parlour’. Eating out of our plastic cups with a disposable spoon we made our way along the promenade back to the bus stop and returned to our ship.